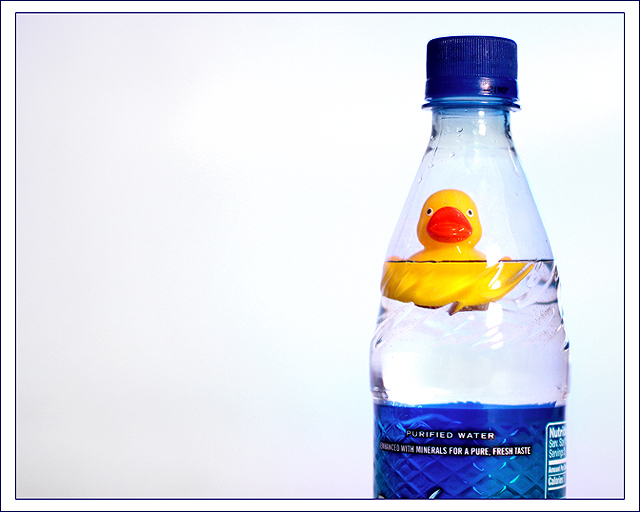 Oh, how did I get the ducky in the bottle? Well cut off the bottom, of course. The bottom of the bottle is sitting in a bowl of water, keeping the water in the bottle from escaping. Simple. And no, I never opened the lid. Thanks for answering the question I was about to ask :) .. creative, really creative! Lose the plastic duck. IMO it adds nothing to the photo and its not funny anymore. Sorry. Nice idea. Too cute and funny. Might be better in portrait mode or with a slightly tighter crop for a larger subject. Fun photo magic! I love em simple and colorful. wish the bottle were straight though, i.e. no nutrition info or logo visible. Very humorous. It's nice to see a photo that makes you laugh. You should crop a litle bit of the bottom but I like the position of the bottle in the photo. good job. a good laugh - and how do they get ships in the bottles? yes, very :) I love it, it has such a quirky feel to it and its very well done. Proudly hosted by Sargasso Networks. Current Server Time: 04/19/2019 12:47:34 PM EDT.